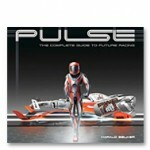 PULSE features Harald Belker's vision of the future of racing. There was a time when the fastest means of travel was a jet, but in 2035, private conglomerates have harnessed magnetic levitation (Mag-Lev) to create trains that get people from place to place in a fraction of the time. To advertise the cutting-edge technology and sheer speed of Mag-Lev, events were held with a handful of machines and fearless racers. Within a few years, PULSE Racing Grand Prix were hosted in major metropolitan areas with the funding of the cities. The world of Pulse racing is introduced and illustrated via elaborate drawings and digitally rendered futuristic vehicles while telling the story of an adventurous young man thrown into the whirlpool of an all encompassing and physically grueling sport. Through captivatingly sleek and futuristic images, the audience follows the racers to the limits of speed and power while they are barely on the ground. The sleds force their drivers to the edge of human endurance while keeping the racing fans on their feet in excitement and enthusiam. Tactics and rules make the outcome of the race a nail bitter until the end as you never know who will emerge victorious in this incredible world of futuristic racing. Categories: Books, we made too much on the reprint. Tag: harald belker.